Someone had tweeted me a day ago or so about this very subject, that we in the UK would have a watered down version. I sat there and tweeted back assuring them that here in the UK we saw, on BBC1, the series Rome that was very graphic both sexually and violently. They seemed happy with that. Then I found something in my inbox thanks to my Google alerts! 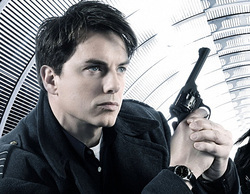 I posted the news report here in Torchwood 4 news http://barrowmanday.weebly.com/torchwood-4-news.html and frankly I feel completely dismayed and confused by this. Both the BBC AND Starz have made this, so why are we both seeing different versions and why the BBC treating us like children. The Doctor Who magazine says “It's to do with the episode timings in the US and what's suitable/unsuitable to be shown on the BBC in the UK.” Hmmm so why is there a timing issue for Starz? And why has BBC allowed material THEY feel isn’t suitable for UK adults? Did they not think of any of this when they both OKed the storylines? Surely they had some say in all of this. RTD kept assuring us all through the making that both companies were pleased with what they’d done so far and now we read this! I can’t really comment on Starz and the issue of timing, though it seems stupid to edit something THEY helped and then to promptly edit it out things because of timing problems. And as for the BBC; are we not grown up who are able to decide what we do and do not watch? This really annoys me that the BBC feels it should make this decision on something it OKed when it was being made! It is shown AFTER the 9 o’clock watershed so what do the BBC think they’re playing at!? This is censorship gone mad!!! The Frustation of a UK Fan! Like many Torchwood fans, I’ve been enjoying the many teaser videos released by Starz. Obviously they must promote the series heavily because of how much it has cost, I believe I read somewhere it was around 8 million pounds! Eeeep! So BBC Wales, BBC International AND Starz need to get their pennies back and then some! Hmmm I suspect this blog is going to be a tad serious, so I shall apologise in advance. Though saying that Dana had a Rant blog not too long ago. Though Dana’s was aimed at another blog! Lol And she was well within her right for her big rant!!! So, as you can tell by the title of this particular blog, I am a frustrated UK fan! Why might you ask. Well if you are in the US, you have little to rant about. And as I said, what Starz has been doing is truly amazing. Where my rant is aimed at is the other two who put money …no wait they’re the SAME companies, just two different branches. So this rant is aimed at Aunty itself! (Errrm sorry US friends, Aunty is what we in the UK affectionately call the BBC no idea why). Torchwood has been off our screens for two years now. That’s a long time to be out of the TV spotlight! Russell has said they not only want the old fans back watching, but new ones too. And I would like to hope that Starz will have succeeded on both counts there. But the BBC has done naaaaathing! !…..Shame on them!!! At first, when the BBC showed some Miracle Day clips in one of their trailers, I thought we were in for a good thing here, after all at that point Starz had only shown the series title and date with some none visual news reports playing in the background. The BBC actually showed us some footage! Now they have let us down! Nothing on the radar at all. I have been watching my Yahoo John Barrowman news group pages for something popping up; some interviews or something……nothing! Not a peep! All we have had to date is the excellent article by SFX and even that was mostly a RTD interview with a couple of snippets from JB and Eve! Do the BBC want this to work? Given how easily they seemed to drop Torchwood after CoE I do wonder. This behaviour from the BBC is starting to scare the hell out of me! This is a series that spawned from the brilliant Doctor Who, it’s not a nothingingness series. It wasn’t badly written and produced, they put as much care and thought into it as Doctor Who. This series is special, just like The Sarah Jane Adventures was. It’s a spin-off that has worked and worked bloody well. But just like the BBC it seems to mean bugger all in their eyes!! They should be promoting the hell out of it, and we’ve seen nothing… Not a peep!!! Should have known really how much they cared when it moved from BBC3 to BBC2 and then finally BBC1 and then……..Gone! They haven’t even updated the damn web site…It’s still “They Are Coming”! Hell not only did they come…made a hell of a mess…and gone home!!! In America they are treating it and it’s fans with the respect it deserves. Here we are being treating like we don’t matter and like the series doesn’t matter! I wouldn’t mind, but it is still, and please my American fans don’t take this the wrong way, a British series, no matter how much cash Starz puts into it. But you wouldn’t think it given how the BBC is treating it! So come on, give us interviews, clips and most of all and damned start date!!! Is THAT really too much to ask? And on that note I shall end this very BIG rant!!! So….Am I the ONLY Brit feeling this frustration? Am I the only one disappointed in the BBC at their lack of doing something to promote this wonderful series? Anywhoo after finding this excellent novel I wanted more and so I started looking and after only a short time succeeded in my quest. At the end of my quest I was both pleased and disappointed. Pleased because there are more books and disappointed because there are only three in total. As well as ‘The Deviant Strain’ there is also ‘The Stealers of Dreams’ and ‘Being Human’, all of which are available on Amazon and I have now ordered…Yay! The fact that these books are based before Torchwood kind of got me thinking about Captain Jack and his past. We already now have 15 Torchwood novels, and three new ones on the way this summer, which is all marvelous, but I do feel that on area has been pretty much and has only been touched upon in some of the novels such as ‘The House That Jack Built’ and ‘Twilights Streets’ and also some episodes of the series and that area is Captain Jack before he took over Torchwood 3. Going by what has been written in the novels and what we have seen in the series Jack was, in truth, a different man to the Jack we know and love to day. Maybe some what more ruthless and care-free and definitely more thoughtless. In my opinion this would be a golden opportunity for writers, not necessarily in the series, but definitely in the book world, to write a series of books that show us in some way how Jack became the man today. At what point did he change? Yes The Doctor changed Jack from a coward to a hero, but leaving him behind obviously left his mark and left him feeling rather bitter. So I do think it would definitely make, if well thought out and intelligently written, interesting reading and it would also be fun! So what do you all think? Do you feel a golden opportunity is being missed here? 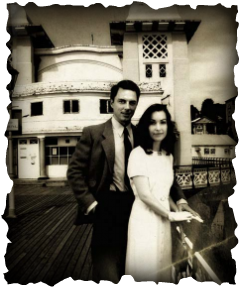 Has anyone ever written or read a fanfic that is based in Jacks Torchwood past? As you may have noticed, I haven't really been around BarrowmanDay (BD) as much as I would be normally. Since myself and Chris started BD almost a year ago now we have gone through many changes and so has my life. With out too much detail my mum isn't in the best of health and is due to have some operations in the coming months. On top of this my 9 year old nephew was hurt and all though it wasn't as serious as it could have been, it is bad enough and he faces months of hospital visits. And thank you ALL for your lovely kind tweets about Robert, he is doing well. In fact right now he's on the PS3! Though the painkillers knock him out for six! I have always fitted my life around the BarrowmanDay day, and in truth for both myself and Dana it is a very long day, but it has always been a pleasure for us both to do. But in reacents months it has got harder and harder for me to fit my life around it and now something must give and for at least the time being it is the BarrowmanDay day. I cannot and will not give you an indication of how long because I simply don't know. But I will say I am not leaving BD completely, I am still keeping things ticking over as any good leader should (twangs red braces), updating the BD site, and also, when needs be, our YouTube page as well as being able to pop my head round on the day, even if it's via my mobile/cell phone. Making sure MeIanto keeps the coffee going and files are all where they should be and the weevil is fed! As well as the things MeIanto and I don't tell you ;) And I know MeIanto/Dana will continue to keep me a breast (stop it!) on what she plans for BD day! I will be chatting with Dana in the not so distant future about BD day. So I ask that you all be patient and that we know how supportive and wonderful you all are and we thank you for that from the bottom of our hearts. I will add we are not closing BarrowmanDay and Wednesdays BD day will continue and I'll give what support I can to Dana! So I am going to leave this now as I do have a more cheery blog to post too. Thank you all again and know that I love you all for being so brilliant and fantastic!!! When I was at Art College, we often spoke of the intimidation of white paper. It is no different for writers, be it stories, poems, songs or blogs. You have an idea and the idea may well be brilliant, but it’s making that first mark. How do you start the journey of your idea or thought….And today is no exception. My thought is Elisabeth Sladen or Lis to her friends; better known to many of us as Sarah Jane Smith, companion to two Doctors, Jon Pertwee and Tom Baker. The first I saw of the terrible news was a posting by Dana, via BarrowmanDay. Megan, my niece and fellow JB fan, was on Twitter. I looked with complete and utter disbelief. I felt my eyes tearing up and I jumped up and went to the main computer to do a frantic search. Surely what I’d just seen was wrong. It had to be. Even those on Twitter who were spreading this awful news were unsure and there was nothing in Google news. Then I found it…my heart sank like the heaviest of stones…Doctor Who Star Elisabeth Sladen dies age 63! Even now typing those awful words brings tears to my eyes as it seems so wrong, so surreal. It was so sudden and unexpected, how could it be true?! When we write our blogs in BarrowmanDay our subject matter always has one common denominator, John Barrowman and for me, and many of our followers and JB fans who are of the same age sort of age the names Jon Pertwee, Tom Baker and Elisabeth Sladen, link us all because they were our first Doctors and Sarah was our first companion. I am pretty sure I will have seen Sarah in her first episode of Doctor Who, way back in 1973, with Jon; though like JB, often remembering the titles can be hard. But my excuse, and probably Johns, is I was only 6 and so didn’t really take much notice of such things, I was too busy enjoying their adventures, seeing these strange worlds and scary monsters and of course, hiding behind a cushion. But as an adult with the internet at my finger tips I now know the episode was The Time Warrior. I do think I may have seen some episodes before with Jon and his then companion Jo Grant, but she left no mark on me. I have no memories of seeing her in any episode, only photographs in magazines and books. But Sarah Jane was different, when I think of Sarah Jane I think of her feistiness and independence. Unlike some of Sarah Jane’s predecessors, she was rarely frightened off by strange creature, no matter how scary they were. She was also both intelligent and beautiful, two things that in the 70s didn’t always go hand-in-hand. She was a journalist who wanted to know more. 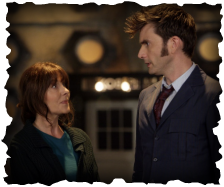 When most girls were thinking about marriage and children Sarah Jane was thinking about the next adventure on a new world and its strange creatures she would meet, with her amazing and mysterious friend, the Doctor. Then...many years later, our favourite Sci-Fi show returned and a short time later so did Sarah Jane in School Reunion with David Tennant (another SJ Fan) and Billie Piper. I was ecstatic…It was so wonderful to see her beautiful beaming face again on our television. For many of us Sarah Jane was as iconic as the TARDIS or Tom Bakers scarf. To have her back on our screens was the cherry on the cake! And then, as I mentioned before The Sarah Jane Adventures…All so very wonderful! Myself and Dana couldn’t do our usual BarrowmanDay, how could we? So for the day, it became “SarahJaneDay”! Dedicated to Lis; we posted pictures and videos of the lovely Lis and her fabulous character Sarah Jane and just shared memories. I send all her family and friends the deepest of sympathy as yours is the greatest loss. Hi – I’m Pat & I’m Mickie’s Mum & she has let me add to her blog – I was really knocked out by the loss of Lis, so suddenly, with no warning, no time to prepare our minds to the possibility of loss, no time to wish her well or, if we wished, pray for her recovery, it makes it so much harder to accept her loss. Lis always seemed so young – she carried her years well, looked barely 50 not over 60 – full of life, & love of life – bright, intelligent & inspiring, she felt like the sister I would have loved to have! Sarah Jane was a brilliant character, perfectly played – always inspiring & informing – yes, you could overcome fears, - it’s right to fight for what is right & just – and it is wrong to pretend to be a silly helpless girl, to hide your intelligence, to pretend ignorance, to let others fight your battles – and yes, you can be clever, gorgeous, fashionable – wear make-up and be a GIRL and above all, be a kind, generous person and use your intelligence intelligently – and be a fighter in a just cause. Today we are lacking real role models for young people and The Sarah Jane Adventures were a perfect vehicle for showing them what was possible, that they all could achieve things if they just used their minds to acquire knowledge and use it – they didn’t have to fight aliens, only those who alienate them – and that friends are the most valuable acquisition. My challenge to those who created Sarah Jane now is to find a way to continue the good work – not another actress to play Sarah Jane but a new character to step into her shoes and continue the work – it is most necessary, the Doctor would want it, he cannot be here all the time & our youngsters need inspiring! So, all my love to Lis’s family & her friends everywhere – and I too will miss them both. Hey there! I think you probably know who I am by the blog title, but if not, I am co-founder of BarrowmanDay and Dana's hubby (giggle). I live in the UK and if you didn't know already ...I'm a big fan of John Barrowman. I love the man, his music, his acting and he is my only real Man Crush! lol! in my blog I'll write about JB and his work. My thoughts and opinions about his work! I hope you enjoy what you read and do please leave comments!